Cut cream cheese lengthwise into four pieces. Place on ungreased plate; cover and freeze 8 hours or overnight. Cut cream cheese into 1/4-inch cubes; set aside. In large bowl, stir all remaining pancake ingredients until well blended. Stir in cream cheese. Heat griddle to 375°F or 12-inch skillet over medium-high heat. (To test griddle, sprinkle with a few drops of water. If bubbles jump around, heat is just right.) Grease griddle with vegetable oil if necessary (or spray with cooking spray before heating). For each pancake, pour about 1/4 cup batter onto hot griddle. Cook until edges are dry. Turn; cook other sides until golden brown. 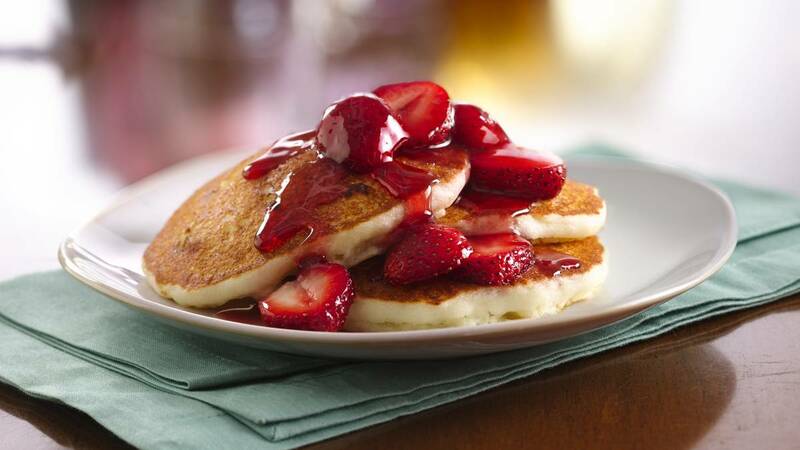 In small bowl, mix strawberries and syrup; serve with pancakes. Substitution Substitute your favourite fresh fruit and pancake syrup for the strawberries and strawberry syrup.